Forty Hands is the founder of the Third Wave Coffee movement and I have always wanted to visit this cafe, but never got the chance to, until today. Founded by the people behind Harry Grover and Spa Esprit Group, Forty Hands offers speciality coffee that is brewed from fresh beans from sustainable sources. The interior of Forty Hands is decorated to look like an old-fashioned coffee shop with tiled walls and wooden tables and stools. Forty Hands offers a decent menu of foods, such as All Day Breakfast, Toasties, Salads, Night Dogs and Other Things. The drinks menu is decided into coffee (Black, White, Chocolate, Iced, Cold Brew, Teas) and non-coffee (Juice, Booze, Sodas, Water). It feels wrong to go to a cafe that brought about the Third Wave Coffee and not have at least one cup of coffee, so I ordered a cup of Cold Brew [$7]. Even as a non-coffee drinker, I can smell the fragrance and taste the smoothness of the coffee. Forty Hands claims that this is the best red bean bun in Singapore so I got one of the Tau Sar Pau [$2.50] to try. It comes in a flat round shape instead of the round shape that most Singaporeans are used to. The dough is soft and fluffy with red bean paste that is fragrant yet not too sweet. This is definitely one of the better tau sar pau I have had, but I can’t comment if this is indeed the best in Singapore. Eggs Cocotte [$18] has everything that a healthy breakfast should include: free-range poached eggs for protein, sautéed spinach for vitamins and minerals, homemade pepita toast for carbohydrates, served with portobello mushrooms, mushroom puree and truffle oil for taste. Not only is this healthy, but it is delicious to boot as well. 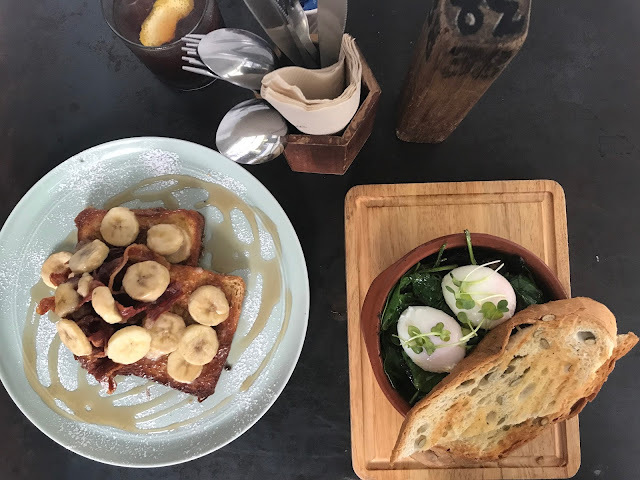 Forty Hands not only excels in brewing coffees from fresh and sustainably-sourced coffee beans, but the food items at Forty Hands also do not disappoint as well. If only Forty Hands were not so hidden in the Tiong Bahru estate, but I guess that is what makes it a hidden gem. People living in the Tiong Bahru, you guys are so lucky, but then I can always order delivery with Ubereats and Deliveroo.